These rule types differ in what data they are applied to, but also what hierarchy they have - meaning in what order the rules will be executed. Keep in mind, all rules are executed from top to bottom. This let you specify in what order the rules should be executed. The picture below shows where you'll find the different rules when editing or creating a dimension. The green area shows the section for adding a platform specific rule, the blue area shows the section for adding a common rule and the red area shows the section for the already existing standard rules. 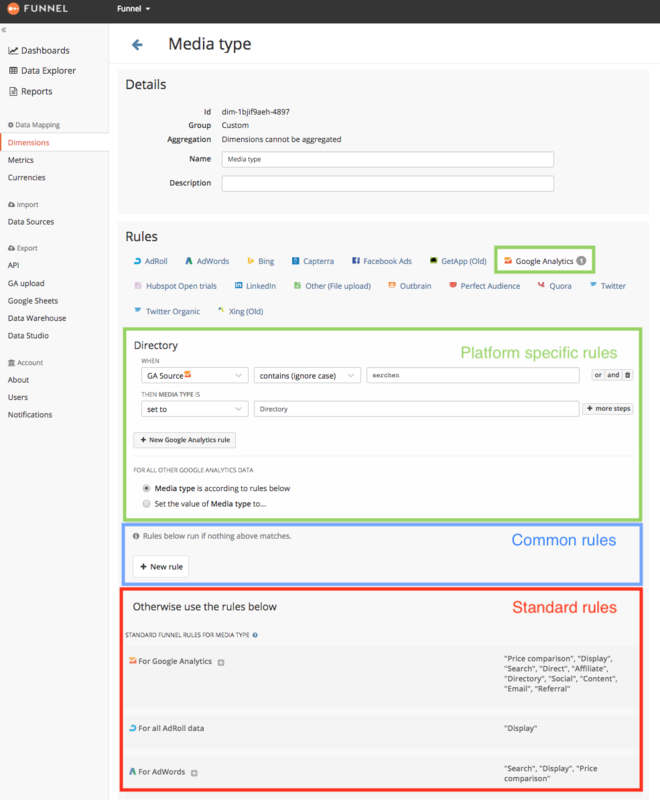 Starting with the platform specific rules, these rules are only applied to data from one specific connection type and can be distinguished in the interface by being fenced by a light grey box. What connection type data that the rule will be applied to is indicated by the selected platform on top of the light grey box. 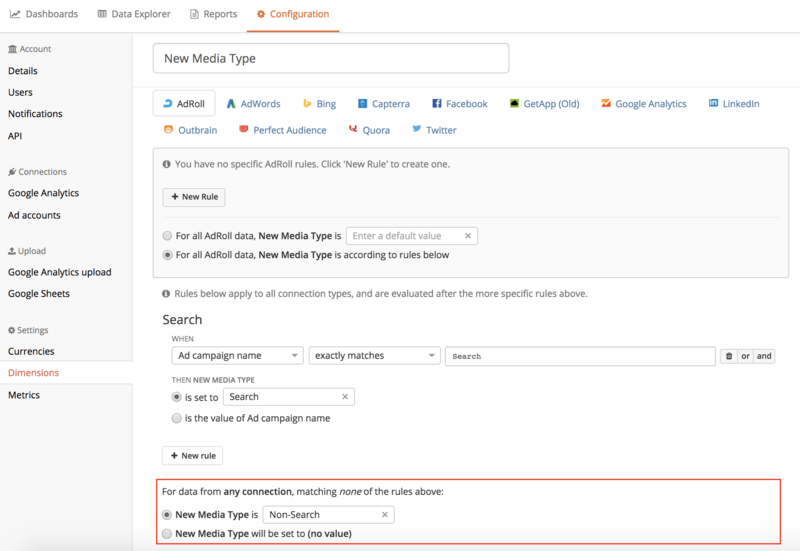 Clicking the "+ New Rule" button in the picture above would in other words result in creating a rule that will only be applied to AdRoll-data. In addition, platform specific rules are having the highest priority when Funnel labels the data, and will in that way override any overlapping common rule or standard rule. Moving on to common rules, these rules are applied to ANY connection type and are evaluated after the platform specific rules. Rules specified in this section are best used when your data is having some common theme that you want to utilise when grouping data. Such an example can be seen below for the default dimension Media Type. 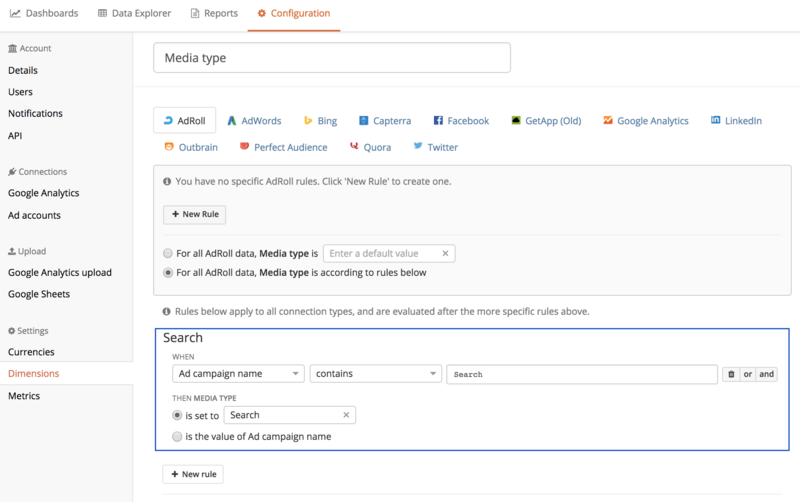 If you for example have included "Search" in all of your Search campaigns irrespective of the connection type, you can utilise this when writing your rule. This means that instead of writing the same rule over and over again for each concerned connection type, you just have to write the rule once. Handy, right?! Lastly, we have standard rules. These rules are predefined by Funnel and can be found in the four default dimensions: Traffic Source, Media Type, Paid/Organic and Campaign. Standard rules can't be removed from a dimension. However, they have the lowest priority when the rules are being executed and can therefore be easily overridden by common rules or platform specific rules. Bear in mind that when you have created a new dimension from scratch, you will see that the standard rules are exchanged for an end rule. This end rule lets you label all data that doesn't match any other rule as either a specified value or (no value). You see this in the picture below.